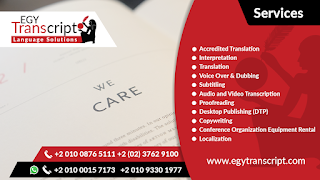 WELCOME to EgyTranscript :) EGYTRANSCRIPT IS THE LEADING ARABIC TRANSLATION AGENCY We provides translation, interpretation (simultaneous, consecutive, & whisper), desktop publishing (DTP), and copywriting. It also grants transcription, subtitling, copyediting and proofreading, voice over transcription, localization, and web development & design. It can as well provide interpreting equipment and conference equipment rental, this made EgyTranscript a one-stop-shop language solution. With the growing interest of photographing and filming both for amateurs and professionals, infinite number of videos are produced and uploaded daily on the internet all over the world through Youtube, Facebook, among other channels. In this regards, videos subtitles have different objectives, for instance it helps outreaching to hearing impaired, putting lyrics directly on the video rather than on the side of the page, and transferring spoken words to a different language. Video or movies subtitling proved to be less time consuming and more cost effective than dubbing, the other way around to translate a video. Videos and movies subtitling is of utmost importance as it will help engaging more audience and keeping them interested where they are catching the video words and message, and keeps the message ongoing. Video subtitling then needs expert hands to handle and get the maximum of it; you can trust EgyTranscript in this regards. Our translators have always an open eye for every word said taking into account cultural sensitivities. EgyTranscript provides you with human reliable services that strictly abide by your deadline whatever the length of your video is. The good news is that all the previous advantages can be realized at affordable prices. Our translation service is integrated with our captioning and transcription services. We assign translation to professional linguists who accurately capture the content and cultural nuances of your video. Linguists have profound experience across a wide range of topics, including marketing, technology, healthcare, finance, government and education, among other fields. When you initiate a translation through EgyTranscript, you usually choose professional translation that includes detailed attention to tone, subject, and meaning. You don’t have to worry even if you do not have the script of the video; our attentive team will offer you transcription services in addition to video subtitling. Arab speaking countries have always been a market for different artistic productions in different languages, for example, movies, series, and also advertisement for various products and services. Being used to watching International productions, Arab audience have a good sense and critical eye for Arabic video subtitling; they can easily spot bad work. Providing Arabic video subtitling service, therefore, should be handled with extreme care and professionalism, and preferably by native Arab speakers. We have earned the trust of many clients over years of excellent practice, with colorful exposure to probably all kinds of videos, scripts and contexts. At EgyTranscript, we are proud of the service we provide that renders the movie comprehendable and engaging. You might have viewers who want to know more about Arab culture and art work, in this case you will certainly need English Video Subtitling Service, whereby you can get them the sense of it. At EgyTranscript, we are experienced in providing this service and we have success stories with several clients. We are exceptionally competent with different dialects from around the Arab world, where our team can understand the content and deliver it as accurate in English video subtitling format. Subtitles we provide will help your audience enjoy their time watching your production that is delivered to them in an authentic and interesting manner. EgyTranscript has a wonderful team of professionals who excel at English video subtitling, something they understand very well and practiced over years. Please contact us if you need subtitling service for movies, videos, lectures, or whatever production; we promise you excellent and timely service. No doubt subtitling requires highly talented and well trained translators who are capable of dealing with different types of content; sustaining the original meaning and context, and synchronizing between image, sound, and text. Our translators at EgyTranscript are experienced in tailoring subtitles to meet the standards of characters per line limit, reading speed, among other important parameters. 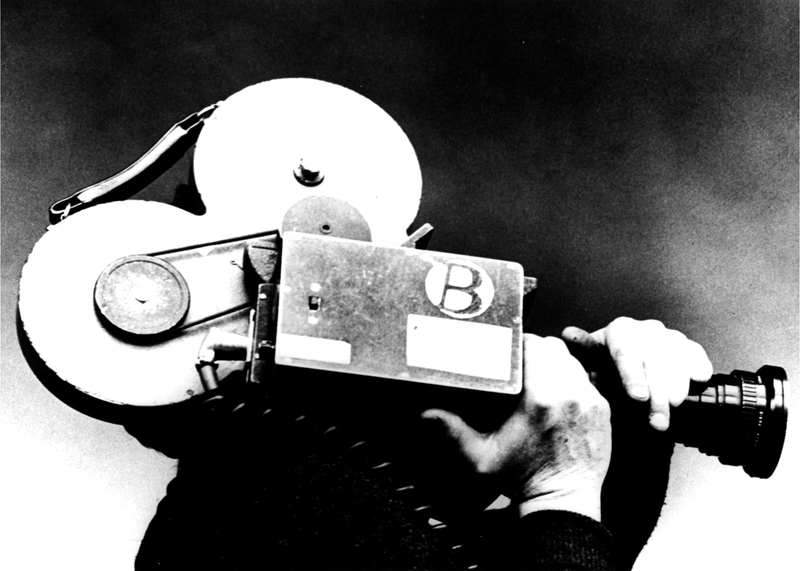 Documentaries subtitling is one branch of subtitling that needs high levels of accuracy and precision. Documentaries are very special type of production that needs long time for the translator to develop thorough understanding of the topic; where information is the core value of this type of production. The translator should also do in depth research to find equivalent terminology in the target language, or come up with alternatives. If you have a documentary that you want to transfer to another language, you will choose between dubbing and subtitling. Besides providing professional dubbing services, EgyTranscript provides accurate and easily readable documentaries subtitling services that will render your document smooth and easily comprehendible by the audience. In order to provide excellent and efficient documentary subtitling service, several factors have to be borne in mind including cultural differences, appropriate timing for spoken and written subtitles, among other factors that EgyTranscript pays utmost attention to. Our translators are trained to deal with different challenges involved, for example, they sometimes work without having a copy of the script, which demands high level of attention to every spoken word. The translator will also translate the spoken words of the narrator as well as the interviewees who in many cases might be children or uneducated people, which require extra work to express their talk. EgyTranscript talented translators always keep an open eye for repetitions, hesitations, and other mistakes that they should drop, and reproduce the text accordingly. Based in Cairo, Egypt, wehave the most professional and talented native Arab translators who master Arabic with all its dialects. Our experience in Arabic documentaries subtitlingproved our excellence in conveying the documentary message regardless of the dialect used or the issue raised. With our excellent and professional service, we guarantee that your documentary hits screens as soon as possible with the most cost effective packages. Quick delivery and competitive prices are our main advantages especially if the documentary is news related. Our team is always ready and trained to provide excellentArabic documentaries subtitling in the shortest time, with the best quality. People in the Arab world are used to reading Arabic subtitles on foreign movies they watch at the cinema. The experience gives them a critical eye that can judge subtitling quality, even if they don’t understand the source language. It is therefore very important that you assign documentaries subtitling to the right company that has highly qualified professionals who will communicate your original message, transferring oral to written and source to target language efficiently. With our professional English documentaries subtitling service, we will deliver your message in a concise and expressive manner that will keep your audience engaged throughout the duration of your documentary. If you have an English documentaries subtitling assignment, please don’t hesitate, contact our team, and we will be happy to offer you the best subtitling service. Interpretation is a very tricky ! Interpretation is a very tricky profession that needs highly qualified personnel, with thorough experience and comprehensive knowledge of different dialects and understanding of cultures sensitivities. Our interpretation service is another edge that we are proud of! We're one of the fastest growing providers in the industry and we strive to deliver 100% accurate Arabic-English interpretation Service that is highly authentic and might sometimes exceed your expectations. Consecutive interpreting is an interpretation mode that is mostly used in field trips, work lunches, and some technical meetings, and workshops. The speaker usually stops after few minutes’ talk that conveys certain message or idea, and the interpreter would then deliver oral consecutive translation of that idea. It is always recommended that the speaker doesn’t talk too long before each pause, while participants are unable to catch up. Taking notes is of utmost importance here as it helps the interpreter conveying the message heard without dropping any idea or thought. Notes in this case are better taken in the target language, so to facilitate quick reading and including while delivering the interpretation. Similarly to translation, there is the source language (SL) and the target language (TL). The difference, however, is that translation is written down, whereas interpretation is spoken. In professional practice, interpretation facilitates communication between individuals, who speak different languages.EgyTranscript is one of the leading Arabic_English_interpretation_companies based in #the_Middle_East and its leadership brings together over 20 years of proven experience in this field. Our clients choose us over other #interpretation_companies because of our superior accuracy, speed and competitive prices. You can feel comfortable outsourcing your projects to EgyTranscript and be sure that every component of your project will be handled professionally and confidentially. As a client, you can rely on EgyTranscript to professionally manage language solutions for your project. Our primary goal, as Arabic English Interpretation Company, is to establish long-term relationships with our clients and to become an integral part of their expansion to international markets. We will help you achieve your objectives locally, regionally and internationally by providing professional interpretation of the highest quality for all of your communication needs. People use EgyTranscript’s interpretation service because they know we’ll get it right. We’ll listen attentively, we’ll learn, and we’ll carefully manage the interpretation process to make sure their business is well expressed– whatever the language is. 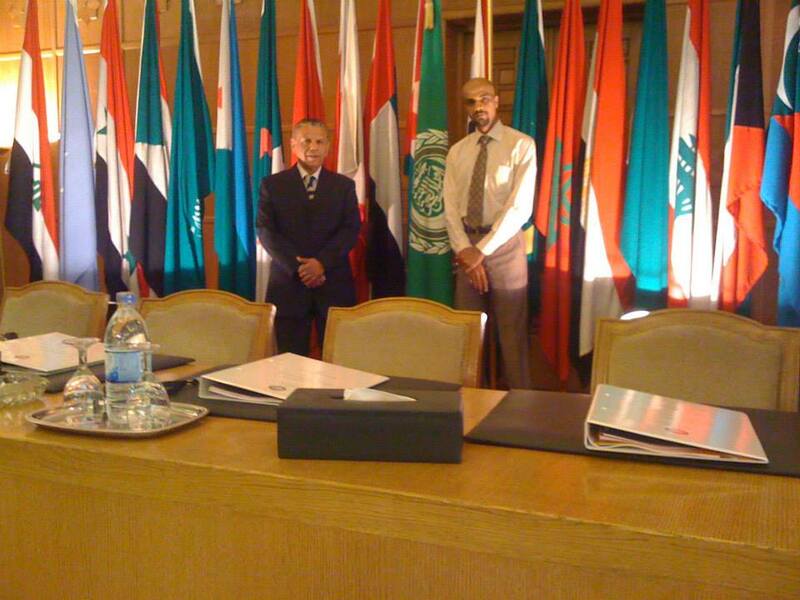 EgyTranscript puts the expertise of translators and interpreters at your hands, combined with simplicity and security. If you need an Arabic English Interpretation Service contact us and we will help you choose between different available services that best suit your purpose. 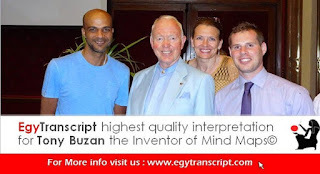 EgyTranscript provides several interpreting modes from which you can choose. The interpreter's function is to convey every semantic element (tone and register), as well as every intention and feeling of the message that the source-language speaker is directing to the target-language recipients. People use EgyTranscript’s interpretation service because they know we’ll get it right. We’ll listen attentively, we’ll learn, and we’ll carefully manage the interpretation process to make sure their business is well expressed– whatever the language is. 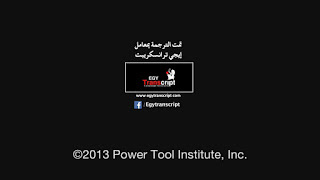 EgyTranscript puts the expertise of translators and interpreters at your hands, combined with simplicity and security. EgyTranscript is one of the leading Arabic-English interpretation companies based in the Middle East and its leadership brings together over 20 years of proven experience in this field. Our clients choose us over other interpretation companies because of our superior accuracy, speed and competitive prices. You can feel comfortable outsourcing your projects to EgyTranscript and be sure that every component of your project will be handled professionally and confidentially. As a client, you can rely on EgyTranscript to professionally manage language solutions for your project. Our primary goal, as Arabic English Interpretation Company, is to establish long-term relationships with our clients and to become an integral part of their expansion to international markets. We will help you achieve your objectives locally, regionally and internationally by providing professional interpretation of the highest quality for all of your communication needs. Simultaneous Interpretation has the amazing benefit of being fast and incredibly time-efficient! Unlike any form of consecutive translation, interpretation enables the interpreterto speak simultaneously as they listen to the speech; this makes the audience receive the translation in the same instance it is produced by the speaker. This saves a lot of time and prevents any distortion or distraction of the audience. This is different from consecutive translation for instance, where the translator waits until the speaker finishes, and starts translating afterwards. 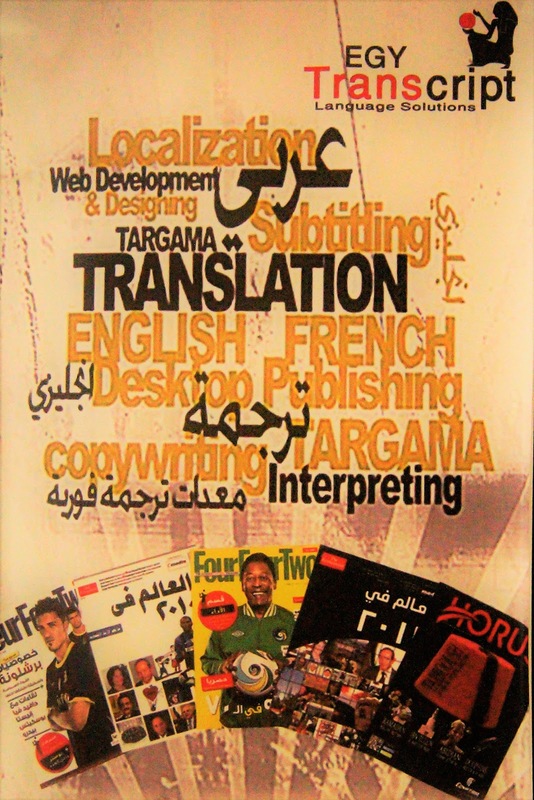 EgyTranscript considers translation an art it masters and a profession it thoroughly understands. Translation incorporates comprehensive understanding of the source language - including terminology, grammar, cultural connotations, and source text subject matter - and a flawless rendering of all that into the target language in a manner that looks, and is indeed, authentic. EgyTranscript’s professional translation team is responsible for maintaining key values, namely, faithfulness and invisibility. Faithfulness is the extent to which, for instance, the Arabic translation accurately renders the meaning of the English source text, while the invisibility of a translator reflects how authentic the translation appears to a native speaker of the target language. The two values have been the core of our business since 2003 and we promise keeping our values in the future, with no compromise. EgyTranscript main area of expertise is Arabic to English translation Service and vice versa. Our team of professional translators has Arabic as mother tongue; they are also competent in English through extensive education and experience. We strive to deliver accurate translation that meets your deadline and exceeds your expectations. We are one of the fastest growing providers in the industry with capacity to work all over the globe; we are one of the few translation agencies that can deliver on time, every time, regardless of your location or time zone. It worth mentioning that our scope of work does not include CAT or TM Translation, we do however, have our own in-house TM and we develop and tailor glossaries according to each requirement, type of business and project context. Interpretation is oral translation of spoken words, simulating the speaker’s pace and tone. Interpretation can be done in a number of ways; each suits certain situation and conditions; yet all serving for better communication. Interpretation can be simultaneous (instant translation), where two interpreters sitting in a soundproofed booth. They listen to the speakers through headphones and should translate everything through the microphone, almost at the same time. This mode of interpretation needs exceptionally skillful English Arabic translators who can come up with the meaning of the spoken sentence, while listening to the next one. It is recommended that translators (English to Arabic or vice versa) receive background information or documents before the event, so they can do some search on the subject and main keywords. Simultaneous interpretation is suitable for big conferences and events, where English Arabic translators translate to large number of audience who wear headphones and listen to the instant translation. Consecutive interpretation however, is a role played by a talented interpreter to communicate a message from one language to another in segments, usually with the aid of notes. Through this mode of interpretation, the interpreter usually works closely with the speaker, where the latter allows a pause for the interpreter to deliver his/her interpretation. Consecutive interpretation is more suitable for meetings and workshops, where it is more time consuming, yet more cost effective. The last mode of interpreting is Chuchotage, which is a French word for whispering, and whisper interpreting is a form of interpretation where the translator (English to Arabic or vice versa) stands or sits right next to the listener(s), whispering the speaker’s words in a different language. It doesn’t require special tools or equipment, it is usually implemented when only one or two participants cannot understand the speaker’s language, which makes consecutive interpreting time consuming and simultaneous interpreting unnecessarily expensive. Many companies provide instant translation, among other translation and interpretation services, yet, there are different levels of knowledge and experience. EgyTranscript is proud to work for different clients throughout the MENA region, both for translation and interpretation services. Our competent English Arabic translators have profound experience in diversity of technical fields and industries; where they always prove committed, reliable, and accurate. EgyTranscript succeeded to maintain the balance between high quality service and reasonable prices. We are one of the leading interpretation (interpreting) companies in the Middle East, based in Cairo, Egypt, the heart of the MENA region; we are committed to providing the highest quality methods and equipment. We can help you choose the interpretation service that best fulfills your requirements and meets your budget. Another edge is our talented translators experience in all modes of interpreting, simultaneous, consecutive, and whisper. This means we offer language translation for any event anytime and anywhere. We also offer conference translation equipment rental, so covering the whole thing from A to Z. 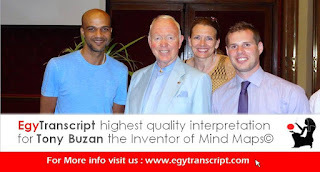 Why get your Translations done through EgyTranscript? There are very important questions that anyone looking for a translation service provider should arrive at and will definitely need to look for answers to. They should come before entering a contract with a freelance translator or translation agency. They are the very questions we asked ourselves before we thought of engaging with this globalized market. The reasons might not be many; but they certainly make all the difference in the translation quality you will get and your experience with the agency that is doing it. What we produce is not so precisely tangible like many products and services. Our tangible product is felt and produced within our working atmosphere of translation and interpretations services which help bridge gaps and introduce civilizations to each other; leading to better quality of understanding. When you have a document for translation or a translation batch that needs to be completed and you need it done to the highest level of professionalism, get in contact with a translation agency and make sure of these distinctions between EgyTranscript and many over there. At EgyTranscript we don’t need all your material to evaluate the cost or the time required. We respect your copyrights and your freedom to choose whether or not to assign the job to us. 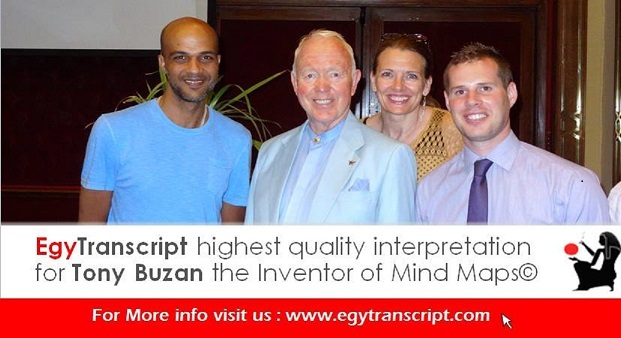 And our translation services are pure human translation which ensures the quality of EgyTranscript's output. It is never done by programs which are also called translation memories or CAT tools. Our work flow passes through three important stages translation, editing, and proofreading, all serving to provide a final, flawless, reflective document simulating the source in the target language, in other words, mimicking the Source but in a target language. So if you have questions about being from another nation, concerns about your copyrights, special instructions, whether humans are to be doing the translation, flexible budgets, and levels of idiomicity and other less tangible elements of natural target language use, get in touch with EgyTranscript , the leading translation agency in Cairo. These are the questions and concerns we expect from thoughtful clients and we are ready to answer them to your satisfaction and to serve you. Be always sure that our team will translate every component of your project professionally and confidentially. As a client, you can rely on EgyTranscript to meticulously manage the workflow and ensure the highest quality in the market. Location: 31 El Ansar St. off Iran St Dokki Sq.